We estimated all this data from services provider financials. Revenues are fitted to nearest calendar year. We attempt to make the IT services numbers as close to HfS definition as possible—as part of this exercise we exclude revenues from subcontracting, we don’t include BPO or business services revenues in this definition and some product services revenues were classified out of scope, if the equipment serviced is not IT – for example, telephony related equipment. 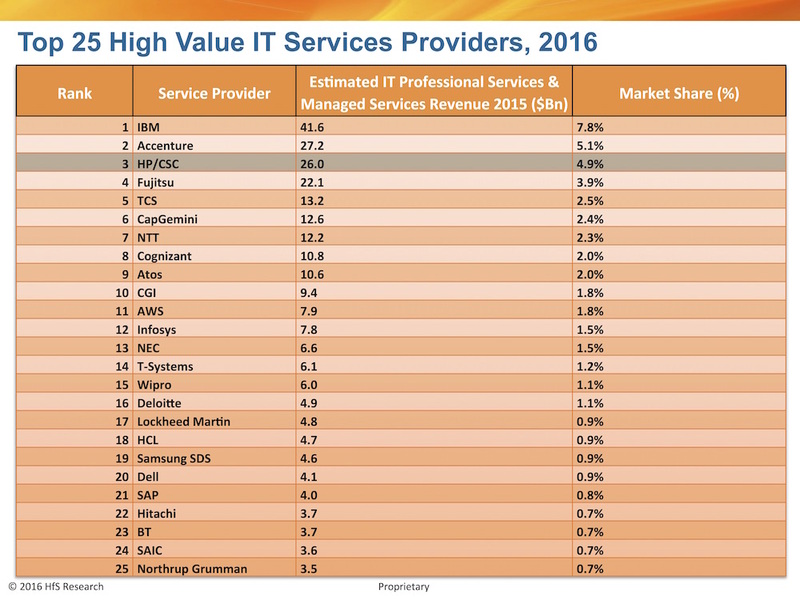 These numbers do not include software-as-a-service, unless included within a broader managed services agreement. Jamie, how did you come up with the $26 Billion number for the new HPE? The merger of HPE Enterprise Services and CSC, brings together the high value services of HPE and the commercial revenues of the old CSC business. The $26 Billion revenue figure takes $8 Billion as CSC without the hived-off public sector business, and $18 Billion from HPE Enterprise Services division, much of which was the acquired EDS business unit. And what's your initial take on the merger, before we get deep into the weeds of the broader implications? This deal brings together two of the original outsourcing behemoths EDS and old rivals CSC. The reasons for the merger given by management focus on the scale of the new company. Certainly scale was an important requirement for IT outsourcing providers in the past, as it gave flexibility and economies to these asset and labor intensive businesses. However, in asset light world of modern IT managed services and the increased use of automation – scale is not a vital component. It does give them access to the very largest of global deals, but HPE, and depending on location, CSC, would have been able to handle anything that crossed its desk. What we have is two large services businesses that have spent the last 3 years hemorrhaging revenues, because they weren’t offering what many enterprise clients wanted or there was another provider able to do the same task cheaper and more nimbly. This issue is not going to be resolved by this merger. The two firms have to reinvent themselves as a modern services firm when contracts are more open-ended, value is counted in revenue growth, not just cost savings and scale is replaced by other features such as agility and innovation as the key differentiators. Well, good timing indeed, Jamie, with the new Top 25. Interested readers can download their complimentary POV on the HfS website here.